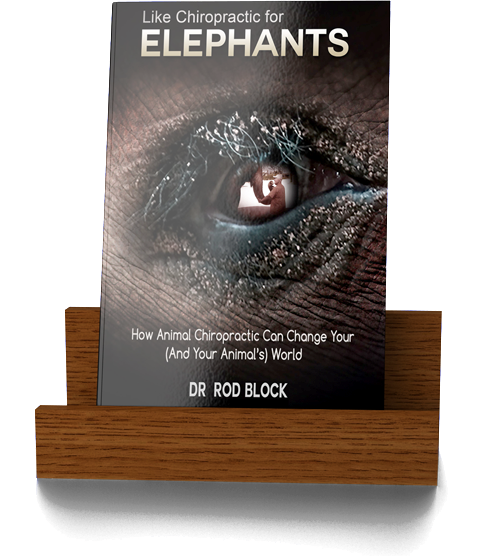 Dr. Rod Block, author of Like Chiropractic for Elephants: How Animal Chiropractic Can Change Your (And Your Animal’s) World, has been providing holistic animal-chiropractic care for over 20 years, through his practice Southern California Equine Chiropractic. Working with veterinarians, he provides lower-cost loving care that prevents expensive future procedures and adds years of stress-free life. Life not only happens to us, it happens to your pet or domesticated animal as well. The difference is you can complain about it and point to the source of your angst. But what about your dog, cat, horse or other domesticated animal? Pets are family members that provide joy, love, comfort and entertainment. In some instances, a source of income for show animals. If your favorite pet were to be suffering greatly, what would you do about it? What if you could care for him or her, non-invasively, providing years of pain-free comfort and lower veterinarian bills, would you want to? One of the pioneers of animal and zoo chiropractic care! 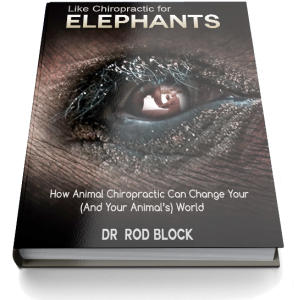 Find out why Hollywood and competitors trust their animals to Dr. Rod. How do you adjust a horse? How can you tell your pet needs care? Learn this and more. Get your copy of the book TODAY! Get free animal care tips, holistic remedies, how-to’s and symptoms to look for delivered right to your e-mail. Learn more about how you can connect with your pet on an emotional, spiritual and physical level. Click Here!